For any kid that ever dreamed of being a cowboy or cowgirl, a dude ranch vacation is the perfect place to try on your spurs and see what your little cowpokes are made of. Some dude ranches can be a working ranch, rounding up cattle by horseback during the day and sitting ‘round a campfire at night. However, many dude ranches cater to families with a resort atmosphere focusing more on outdoor summer activities such as canoeing, swimming, fishing, hiking and of course horseback riding and a campfire round up each evening. A dude ranch vacation is ideal for families looking for an all-inclusive vacation as most include three square meals a day plus your activities. 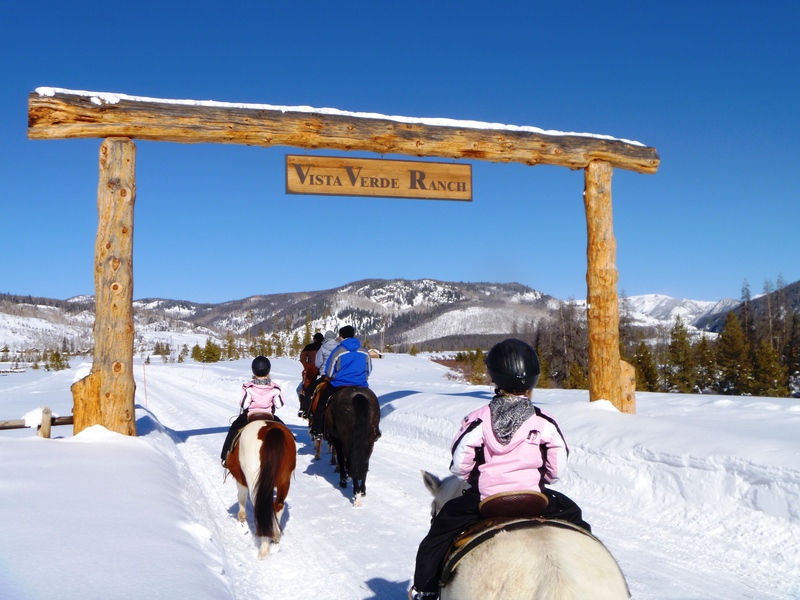 Resort4Kids picked our 7 Top Dude Ranches to take the kids. Why it’s great: Paws Up is an all-inclusive resort that has a number of options. Combine a resort, a ranch and even an American “safari” vacation plus a full selection of outdoor activities and you have the Resort at Paws Up. What makes Paws Up fun is the oversized tent accommodations or “glamping” in the wilderness, along with wagon rides, cattle drives and wilderness workshops for kids. Why it’s great: Family owned and operated, Drowsy Water has won a number of awards making it a top all-inclusive resort in the world. Drowsy Water is also one of the few that have programs for ages 5 and under, allowing parents and older children to participate in ranch activities. Ideal for: Families with infants and older. Why it’s great: Triangle C Dude Ranch is great for the entire family and offers horseback trips to Yellowstone and Teton National Park. There’s also hayrides, square dancing, archery, knife throwing and even sleeping out in a tipi. Why it’s great: Vista Verde Guest Ranch is a stunning luxury resort where you can still learn how to herd cattle, learn about horses and participate in a rodeo. In the evenings you can relax in your private villa. Ideal for: Families who like a mix of togetherness and adult & kid only time. Why it’s great: Think summer camp meets Dude Ranch with an all-inclusive package that meets the entire families need. With a fully supervised children’s program and plenty for mom and dad to do on their own, C Lazy U, open year-round is another balanced ranch of adventure and family time. Why it’s great: Black Mountain Ranch is a smaller capacity ranch offering a longhorn cattle and overnight pack trips. Their 40 person capacity means lots of individual attention. There’s also rafting, trap shooting and fishing available. Ideal for: Families with older children and teens. Why it’s great: Combine an exciting adventure with a Dude Ranch vacation. Tarryall offers rock climbing, fly-fishing and white water rafting excursions in addition to the typical dude ranch experience. Tarryall does have programs for the youngsters, but we think older children and teens will get the most out of the ranch. Many ranches are open in the winter too. Consider the perfect winter-y scene of sleigh rides, cross-country skiing and tubing down a snowy hill. Then kick back next to a crackling fire with hot cocoa and fresh baked food. Rates and crowds are often lower in the winter season as well. Not seeing the perfect ranch here? Check out the Dude Rancher’s association and search by area, amenity or kids program. Have you done a dude ranch with your kids? Ranch Vacation with family is a real fun. Here we spent quality time with each other. Truly said, we eat a lot and on-time as well. Riding is also a fun in ranch vacation, Created a perfect picture. Looking for a real ranch experience with horseback riding (lots of it) and time in the open air with my son (15) and daughter (12) and my wife (49). I am 62. We live in NJ, my children have been sheltered but I grew up in a small coal mining town in Pennsylvania. I want my children to see another side of life. Hello Michael, glad to hear your family is interested in a dude ranch holiday. Since your kids are older and, hopefully, everyone in the family rides, you have lots of options. The Dude Ranchers Association is a really helpful resource in sorting through the many types of ranch vacations. For example, you can go here: https://duderanch.org/by-activity-amenity and search for ‘Advanced Rides’ and “Cattle Drives’ and that would get you some real working ranches that would have more of the lifestyle you seem to be looking for. One of our authors recommends the Hideout in Shell, Wyoming for this type of trip.